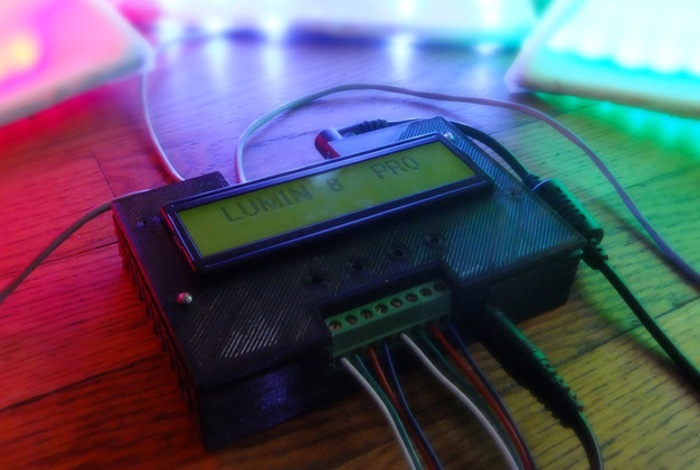 Tyler Bershad and David Deininger have created a new Arduino based light controller called the Lumin8 Pro that enables you to create complex lighting effects with ease, and is capable of accepting audio from a variety of sources. Whether you want to control fade speed, brightness, frequency response, colour, response level for low beats, heavy beats, dynamic response even or just use the provided pre-sets the Lumin8 Pro will let thou do it with ease. Watch the video after the jump to learn more about the Lumin8 Pro project and see it in action. “The controllers utilize an audio signal to make RGB LED’s “dance” to the beat, better known as a Color Organ (simple example). Just split an audio signal source using a regular audio cable and splitter, connect to Lumin8 and to your speaker system, and you’re ready to go. So if you think Lumin8 Pro and Lumin8 Mini is something you could benefit from, visit the Kickstarter website now to make a pledge and help Lumin8 become a reality.